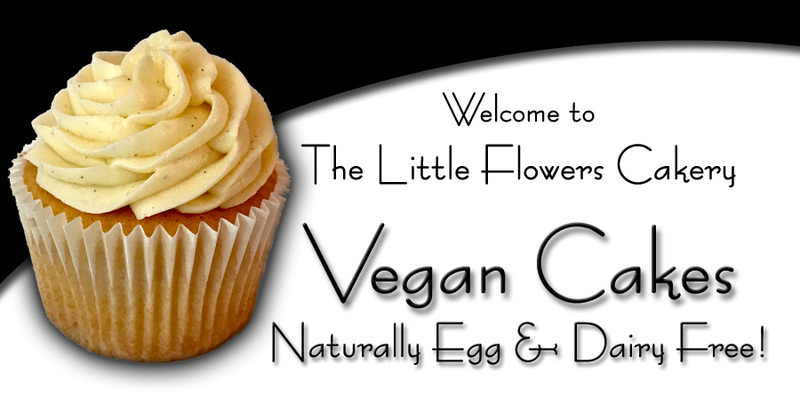 Here at The Little Flowers Cakery, I bake delicious Vegan cakes which are naturally egg free and dairy free. I can also adapt recipes to accommodate those with gluten allergies. I have a range of ready to order cakes and cupcakes and also offer bespoke cakes made to your requirements. Based in Hythe, (Waterside area of Southampton), I have enjoyed creating beautiful cakes for many events such as childrens parties, weddings, birthdays, anniversaries and fund raisers. Please have a look at my ready to order range and choose your flavour and size of cake or flavour and quantity of cupcakes. If you have a design you would like me to create, then please get in touch as I design stunning bespoke cakes to create that wow factor to make your party or event extra special. My cakes and cupcakes are collection only, but I may on occasion be able to accommodate local delivery. Contact me with your requirements by clicking the email link below. Please feel free to visit my Facebook and Instagram pages.